Just had to share a photo of my Emma on her friend's pony. 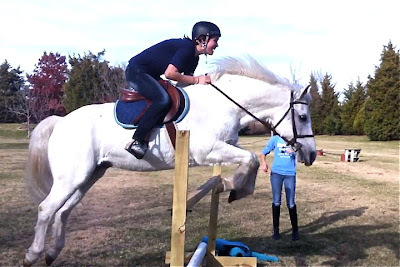 She's been riding for almost five years, and has jumped on large horses, but her friend's pony has a lot of gumption. Here, they're going over the tallest height Emma has ever jumped. She's clearly way too tall for this horse, but she's having fun anyway. Contrast this with the photo from her first horse show here. Yeah, she was totally having a blast. I love to see her that way! No need to appologize, Emma IS AMAZING!! Gosh, this makes me want to jump out of my office chair and get on that pony with her!! Looks like FUN!! !